Depishine moussant is a premium facewash which cleanes the skin, open up the pores and offer skin lightening with its uniquely blended actives. It’s unique penetration technology helps to get the instant glow and radiant skin from the first use. Squeeze desired amount of Depishine SPF 50+ on fingertips and apply on freshly cleaned face, neck and other exposed parts of the body 15-20 minutes prior to sun exposure. Re-apply approximately every 3 hours, or after swimming or sweating heavily or as needed. Apply everyday for maximum protection. 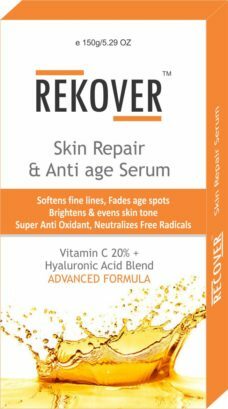 REKOVER Serum helps combat all the signs of skin aging through its multiple modes of action. Decreased Ceramides level with aging leads to drier skin with more wrinkles. REKOVER Serum effectively replenishes the skin’s Ceramide level and neutralizes free radicals that accelerate the aging process. Minimizes the visibility of wrinkles and fine lines. Improves skin’s radiance and results into youthful and younger looking skin, with additional long lasting moisturization. This shampoo acts on P ovale which is the main cause of dandruff. 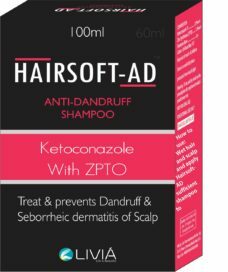 Hairsoft AD helps in reducing the scalp itching and dryness. Ingredients : Ketoconazole and Zinc Pyrithione. Livia Healthcare is one of the fastest growing pharmaceutical companies in India focusing primarily on consultant specialties involving skin disorders, skin allergies & cosmetic procedures.